TOU pricing is based on the actual time that electricity is used, including the time of day, day of the week (weekday/weekend), and season. How Does the Time-of-Use Price (TOU) Structure Work? Prices for electricity will vary according to demand levels at given times of day. Higher prices will be charged during on-peak periods, when demand is highest. Lower prices will be charged during mid-peak and off-peak periods, when demand is lower. What are the TOU rates, and when are they in effect? Find out more about TOU rates by visiting the Electricity prices section of the Ontario Energy Board website. Why did we change the TOU price structure? We changed to comply with an Ontario Energy Board (OEB) mandate, directing that we calculate electricity delivery costs according to the TOU price structure. Higher demand leads to higher costs, which adds to provincial electricity costs. It's hard on the environment because it adds to the amount of new generation, transmission and distribution infrastructure Ontario must build. TOU pricing is intended to encourage consumers to use electricity during off-peak times, to reduce the impact on the electricity grid. 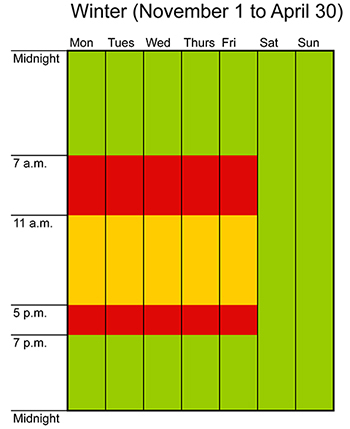 These charts show weekly calendars for Time-of-Use price periods - one for summer and one for winter. 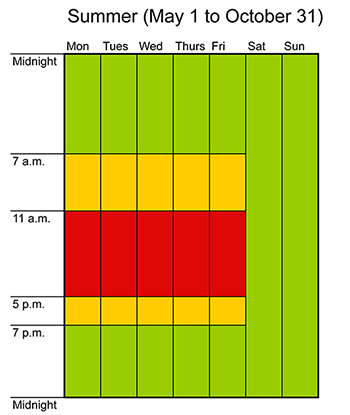 Green represents off-peak hours, which total 64% of the total week, and stay the same summer and winter. If you can shift most of your consumption to off-peak times, you will benefit from lower electricity rates. How can I benefit from TOU? Time-of-Use pricing rewards you for using electricity during low-demand (off-peak) periods whenever you can. By making simple changes to the times of day you run major appliances, you will be able to keep your costs as low as possible. For example, if you do laundry on weekdays at 5:30 p.m., you will be charged higher (on-peak) rates. Waiting to do laundry after 7 p.m. can save you money, because lower (off-peak) rates will be charged. Why did my account number change? To serve you better, and to move to TOU pricing, we designed and installed a new customer service computer system. To activate this system, we gave each customer a new account number. Your bill will show the new account number. This change will have little impact for most customers, but if you pay your bill online or by telephone banking, you will need to update your payee profile after getting your new account number. We will work closely with customers and financial institutions to make sure account number transitions, and other changes related to TOU and our new customer service system, go as smoothly as possible. We also offer ENWINconnect, which will help you understand your consumption patterns, and find ways to manage your costs. ENWINconnect is free for all customers who are subject to TOU rates. It is a new, interactive, online tool, available FREE when you sign up for this service. Now that you have moved to TOU pricing, you are able to sign up for the convenience of 24/7 online access to your account information. Connect with your data online, 24/7. Create easy-to-understand graphs and charts. Create your own consumption reports. Use your data to make energy decisions. "Load Shift" your usage to benefit you the most. Receive alerts about heavy consumption. Sign up for pre-authorized payments. Receive emails when your bill is ready. Learn about safety and conservation. Read the latest electricity news bulletins. Receive general and emergency emails. Click here to view some energy saving tips! Will My Energy Usage Still be Private? We will be able to see how much energy you are consuming and at what times. But we will not see how you consume energy, or why. Other than allowing more frequent, accurate readings, nothing will change. Your private information will remain, as always, private. To learn more about Time-of-Use pricing, click here. To learn about conserving energy using energy-rated appliances, click here. To learn about ENWIN's conservation and safety education programs, click here.